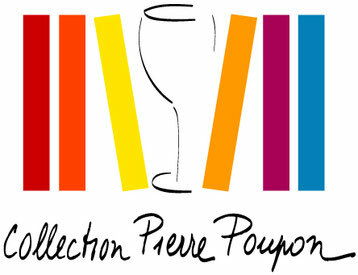 Romanée-Conti, Chambertin, Montrachet, etc. This atlas tells the story of these mythical Crus thanks to detailed maps and the history related to the names of the Climats and lieux-dits. The patchwork formed by numerous parcels, called Climats, in the Côte de Nuits and the Côte de Beaune, gives the great wines of Burgundy their original character! These Climats were registered in Unesco’s World Heritage List in July 2015. They are the result of a 2,000-year hard work carried out by men who have known how to take advantage of the incredible diversity of geographic and climatic conditions to create an exceptional mosaic of top-ranked Crus that are famous worldwide. It is the first time that this story is told exhaustively, displaying the detailed maps of the 35 viticultural villages and giving comprehensive explanations about the origin and meaning of the 1,463 Climats and lieux-dits names! 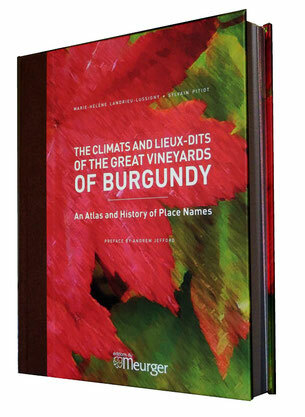 Translated in English: The Climats and Lieux-Dits of the Great Vineyards of Burgundy. 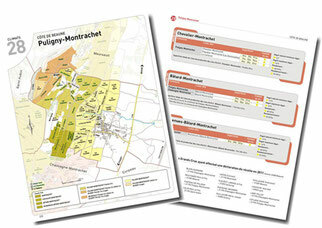 In part one, you will find the vineyard maps of all the Climats and lieux dits covering the 35 villages or towns producing great wines of Burgundy in the Côte de Nuits and the Côte de Beaune. They are completed by the list of the Climats and lieux-dits ranked by appellation: Communal, Premier Cru and Grand Cru including the surface area of each plot, the colour of the wine produced and the name of the vine growers in charge of these Grands Crus. In part two, you will find, for the first time in this type of publication, detailed and clear explanations about the origin and meaning of the 1,463 Climats and lieux-dits names, in a lively style. The parcelling out of the Burgundy vineyard in numerous little plots is a very specific feature of our region. Each parcel has its own characteristics, its identity, its history and name that make it different from the other parcels. Indeed this book mainly deals with this infinite diversity.